Broccoli is a highly popular vegetable in the United States, which makes it tough to write about.Because most folks like it they tend to know a lot about preparing it.So for many of you, this will simply be a refresher.However, I encourage you to look at the recipes, which might be a little different from anything you have tried in the past. Not surprisingly, broccoli is a member of the cabbage family.But did you know that when you eat broccoli you are eating flowers?The highly prized florets are actually the buds of the flowering plant, harvested before they have opened up.Less valued, but nonetheless important, is the edible stalks, which contain a lot of fiber and nutritional value but are often overlooked and thrown away.One reason for this is that the stalks can be tough, especially if thick or aged.However, taking a vegetable peeler to the edges of the stalk can turn a once ignored possibility into a highly versatile vegetable. Broccoli is considered one of the most healthful of foods.It boasts loads of fiber, calcium, vitamins A, C, and K, (among others) and it contains antioxidants and cancer fighting phytonutrients. 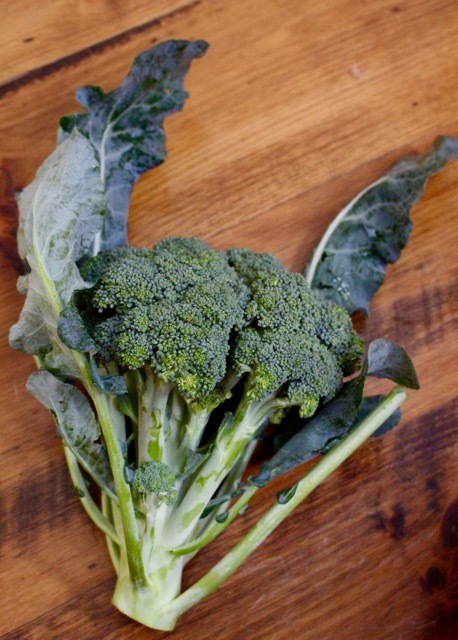 Choose bunches of broccoli with tight, dark green florets and thinner, crisp-looking stems.Avoid bunches with yellowing, opened, or slimy florets and with limp or tough looking stems.To store, place unwashed broccoli in perforated plastic in the refrigerator for 3-4 days.The longer broccoli is stored, the more nutrients are lost, so try to use it as quickly you can.Organic broccoli should be soaked in salt water for at least 5 minutes just prior to cooking or eating raw in order to remove little critters that might be hanging out in the florets. One of our favorite ways to eat broccoli is simply steamed.Apparently, steaming does not leach out nutrients and it is a quick and easy method of preparation.Once steamed, broccoli can be tossed with any number of items.It is great with almost any salad dressing.It is also wonderful flecked with lemon zest and sprinkled with lemon juice, salt and pepper. If you are bored of simply steamed broccoli, try roasting it for yummy, caramelized goodness.Preheat the oven to 425.Toss broccoli florets (with a bit of stem) with olive oil, salt and pepper.Roast on a baking sheet for about 20 minutes, or until crisp tender and parts are browned and caramelized.Finish with lemon zest and lemon juice, balsamic vinegar, and/or Parmesan. Broccoli is also a winner in stir-fries.Start cooking the broccoli before you cook the more tender vegetables in your stir fry to give it plenty of time to cook. Try sautéing broccoli with onion and garlic, then adding vegetable or chicken broth just to cover, and cooking until broccoli is tender.Blend and serve as a delicious soup.Broccoli soup is great with other add-ins such as potato, leek, cheese, cream or milk, and/or bacon (sprinkle on at the end). However you cook broccoli, be sure to stop the cooking before it gets really mushy and dull green, which is that point at which a number of key nutrients are lost.It can help to “shock” broccoli in an ice water bath after steaming it, to quickly stop the cooking process and to preserve its bright green color. Broccoli and broccoli stems are also wonderful in raw preparations.Quickly blanched broccoli florets are fantastic on a crudité platter.Raw florets and stems are great in salads.I love the stems shredded and used in coleslaw.The food processor is an easy and quick way to shred broccoli stems.Just remember to take a vegetable peeler to the edges of the stems if they seem thick and/or tough. This is a great way to get your family to eat broccoli.These mashed potatoes are addictive!The recipe is adapted from EatingWell, Jan/Feb 2010. – 1 large bunch broccoli, with bottom 2″ of stalk cut off. 1. Peel potatoes or leave skin on (depending upon your preference).Cut potatoes in half lengthwise, and then cut each half into 4 wedges.Place potatoes in steamer insert over boiling water and cover.Steam potatoes until almost tender, about 8-10 minutes. 2. Using a vegetable peeler, peel outer skin of broccoli stalk.Cut broccoli to separate florets from stem. Cut any large florets in half.Coarsely chop stem.Add to potatoes and steam an additional 8-10 minutes or until both potatoes and broccoli are very tender. 3. Meanwhile, heat milk, broth and salt in a small saucepan until hot.Coarsely mash potatoes and broccoli with a hand masher.Add hot milk mixture and cheese.Mix well.Season to taste with salt and pepper. This salad is a favorite at picnics.If you had your eyes closed, you would never know you were eating raw broccoli.I think the recipe originally came from foodtv.com, but I have not since been able to find it. 1. Break florets into small pieces and dice stalks (you want two cups at this point) and place in a medium sized bowl.Add green onions, grapes, and celery. 2. Whisk mayonnaise with curry powder, sugar and vinegar until sugar dissolves.Pour over vegetables in bowl and toss until completely coated.Add nuts just before serving and toss to coat.